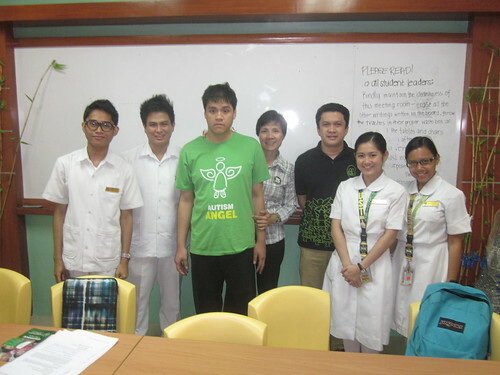 Team ASP, led by National President Jan Pena, met with the UST Nursing Central Boards of Students (NCBS), the college student council of the College of Nursing and with the UST College of Education last 30 January 2014 to deliver their certificates for volunteering in the recently concluded Angels Walk as ushers and marshalls. 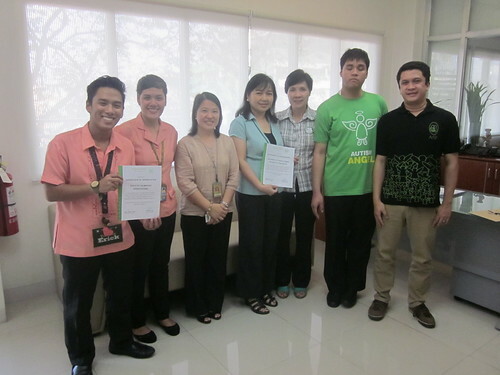 Jan Peña and UST-NCBS shared each organization’s advocacy calendar. Upcoming events that touch on autism awareness, acceptance and inclusion include, ”LENSES: Looking, Enhancing, Nurturing Societal Empowerment and Service”, and later, “Positivism Towards Autism”. Through these events, the NCBS aims to develop a sense of awareness on the different issues regarding autism and its implications to society, to demonstrate social activities that exhibits a positive environment and understanding on the needs of persons with autism, to translate learnings from the seminars into actions that can be practiced everyday, to show a positive outlook in dealing and interacting with persons with autism and to differentiate the ways on how we can answer to the needs of these individuals. ASP Trustees Grace Adviento and Beth Udquin will be resource speakers on the ““Positivism Towards Autism”” seminar to be held on 26 February 2014 at the St. Martin de Porres Building, Dr. Hubert GH Wong Nursing Auditorium from 7:00 AM – 12:00 NN. The ASP team proceeded to the UST College of Education to personally deliver the certificates and extend their gratitude for the College’s support. They were warmly welcomed by the Asst. Professor Pia Rabacal, who shared a short essay made by one of the volunteers. January 19th marked Autism Society Philippines’ (ASP) 25th Year Celebration. The event attracted 10,000 participants from all over the Philippines, filling the MOA Arena to the rafters -- making it the biggest autism advocacy event in Philippine history. The call time for the marshals was 5:00 AM. All were a little bit sleepy but were very eager to make the event successful. I was more motivated, especially when I received my all access ID. The breakfast was given and after, there was a small tour around the arena. Looking around the arena, I felt overwhelmed and secretly, I wondered if it was really possible that we could fill the whole place. The arena was huge, much bigger than the locations where I have witnessed advocacy walks for the past four years. After the tour, an orientation was given in order to assign tasks and area of responsibilities for the seating and actual walk. Volunteers from the Guild of Thomasian Speducators (GuTS) were assigned to the first and second floor but I was surprised when my name was asisigned to the fourth floor. When I went up, I was a little bit afraid. The fourth floor was very steep and I was thinking that the children may be afraid of the height. However, I was also thinking positively. More than the physical barrier brought about by the location, the advocacy to promote the awareness and rights for children with autism would be greater. As the sun rose, more and more people filled in the arena. The place was covered in green, the families of children with autism were all smiles and excitement was radiating off them. Geared with my go-stop sign and neon orange vest, I stood on my ground and assisted the mass of people who entered right after the gate of the Arena. The Pre-Opening Program started at 8 AM. The program started with the showcase of performers with autism and some invited guests artists. The ASP Dream Girls were truly splendid. A round of applause was given to them as they sang their hearts out to their own version of songs. Another splendid performance was presented by ILLC Heartthrobs who danced and ILLC Hunks who sang “Just the Way You Are”. Truly, their showcase of performance enabled the people to see their abilities, more than their disability. At around 11:30 a.m., the marshals were instructed to lead the people out who were under their area of responsibility. There was a slight difficulty, especially when the participants had to wait before they could go down the ground floor. As expected, some children with autism from my group started having their tantrums and parents were getting anxious. The walk started from the arena and then around the mall and back to the arena. A lot of people got to witness the advocacy message of a lot of SPED schools and organizationa. Some passersby stopped and waved their hands, others cheered for the children, while some are still uninformed and seemed clueless about the essence of the walk. But in the end, it had been truly successful. The mass of the people that I saw was a proof that people are starting to become aware of what autism is all about and understand beyond the stereotypic ideas brought about by the disability. I truly hope that the walk paved way for uninformed people to become aware of what autism is and strengthened the resolve of those who are advocating for the rights and inclusion of these children. One cannot quantify the sense of fulfillment one gains from volunteering. Become an ASP volunteer, by joining the ASP Angel Corps. By sending your name you are in the list of potential advocates who may be activated when an event or project arises. Sign up today.